While it’s the most wonderful time of the year right now and carolers can’t keep their holly jollies to themselves even if they tried—there’s something else lurking in the air. Holiday-ruining engagement blunders. (Try saying that five times fast). But whether you’re the proposer or the proposee, you should be highly aware of certain hazards that could not only dampen your joyous engagement time, but also potentially ruin Christmas. And no one wants that. So don’t be a Grinch. We know. We know. Rings are expensive. They can cost a pretty penny to get the sparkle just right. But, engagement rings are also something you should be able to plan for. Likewise, Christmas is something easily anticipated because it comes every year on the same day. Now, we’re not saying don’t propose on Christmas Day under the tree. But we do advise against the ring being her only present. It’s kind of like that poor kid whose birthday has always been dangerously close to the 25th so they always got combo presents that were ultimately not the equivalent to the amount of gifts their sibling with a summer birthday got. Plus there’s the scrutinizing family aspect. I know one friend whose grandma still, to this day, reminds her of the Christmas her cheapskate husband proposed and didn’t get her a “real gift.” Do not be this person, my friend. Just budget a little better and buy her a little something else. This possible blunder totally depends on your potential spouse. But think about it. You’re at an office Christmas party or the entire family is together for Hanukkah, or whatever the scenario may be—if you have a shy person, a public proposal may not be ideal. Also, if it’s not your party and you didn’t give the host a heads up, they may be upset you stole their thunder. Or, if you gave someone the heads up, they could spoil it for you. Or, instead of having a romantic moment, your entire family, including bearded Aunt Ida, will rush you like a group of linebackers all trying to get a kiss and possibly try on the sparkly themselves. Long story short, know your surroundings and the desire of your future bride/groom. 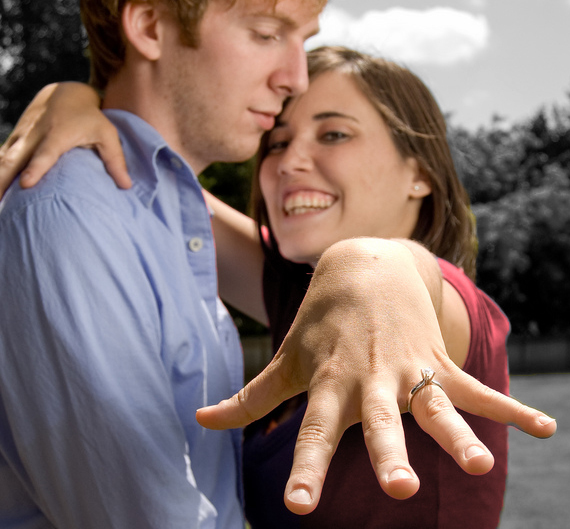 Consider a more secluded proposal (under the mistletoe is nice!) before getting ambushed by everyone. The holidays are already so loud and crowded as it is. Sometimes the quieter approach isn’t just more romantic—it’s safer! It’s not a secret that this time of year is a great opportunity to buy a dynamite ring for practically half the price. But stop, drop, and roll yourself away from the price tag before doing anything rash. There are still very important things to consider when purchasing your engagement ring. The most important is that it still needs to be something your girl will like. If you lady says she wants a triple classic princess cut but you think the solitaire is great because it’s significantly cheaper, think again. Sure, you want to work with your budget, but don’t blatantly disregard what she wants just for price sake. Because she’ll know. Women always know. Don’t disappoint your bride-to-be this holiday season because of a sale. Put thought into your ring. Make it special. After all, don’t you want her to wear it forever? The holidays are a great time to propose, but make sure that the spirit of celebration and sales doesn’t become overbearing over the real important part—the fact that you’re getting engaged to the love of your life. Because in the end, that’s what matters, regardless of the time of year.